Click on the image for upcoming Conferences and Meetings. When Optometric Physician is delayed, it's usually because I'm traveling, at a meeting or I'm intentionally waiting for something big to happen before writing about it. This week, the delay was for a special reason. 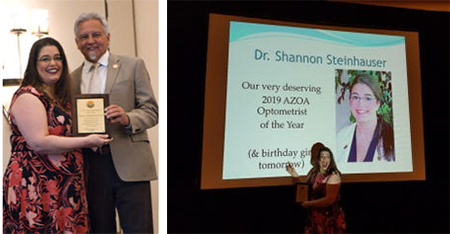 This year, the Arizona Optometric Association named my better half and partner in everything Optometrist of the Year. Shannon has been a tireless worker for our state association and for our profession. She served as membership chair, has put together our top-notch CE programs for the past 12 years and is a past president of the AZOA. I could not be prouder of my wife for this well-deserved honor, or more appreciative of my Arizona colleagues for recognizing her dedication and commitment to our profession. On a personal level, Shannon is the structure and organization of our practice as well as our home. Professionally, she is the perfect match for my ocular surface interests with her incredible expertise and knowledge of glaucoma and retina. Even better, in most areas (except perhaps politics) we are almost always on the same page. We share the same passion for animals. We are truly two peas in the same pod. To all of the ODs of the Year across the country, my warmest congratulations. Being named OD of the Year by your colleagues is a very big thing. To my own OD of the year, I could not be more proud or love you more. Want to share your perspective? Write to Dr. Epstein at artepstein@optometricphysician.com. The views expressed in this editorial are solely those of the author and do not necessarily represent the opinions of the editorial board, Jobson Medical Information LLC (JMI), or any other entities or individuals. In a prospective, randomized, participant-masked, crossover clinical trial, 28 astigmatic participants were tested for the following conditions on different days: full sphero-cyl correction and undercorrection by 0.25, 0.50 and 0.75 DC, while maintaining spherical equivalence to ascertain the impact of altering cylinder (cyl) power and axis on vision in astigmatism. Axis was also misaligned between -30 degrees and +30 degrees, in 10-degree steps. For each configuration, monocular high- and low-contrast visual acuities (HCVA, LCVA) were measured at 6m, and participants rated vision clarity (one to 10), vision satisfaction (one to 10) and vision acceptability (yes/no). Linear mixed models were used to compare visual performance in the overall group and in low, medium and high cyl subgroups. Undercorrecting cyl power affected all groups equally. Undercorrection by 0.75 DC was significantly different to full cyl power for all variables, while 0.25 DC undercorrection did not cause any significant decreases. Undercorrection by 0.50 DC was significantly different to full cyl power for HCVA and vision acceptability. Axis misalignment affected the cyl groups differently, with the greatest impact in the high cyl group, followed by the medium then the low-cyl group. Misalignment by ±30 degrees caused significant decreases in almost all cases, while misalignments by ±10 degrees or ±20 degrees caused significant decreases for some cyl groups and test variables. Undercorrection of cyl by ≤0.50 DC while maintaining spherical equivalence had no significant effect on HCVA, LCVA, vision clarity or vision satisfaction, while the amount of axis misalignment that could be tolerated was dependent on the cyl power. Investigators wrote that the results might have practical ophthalmic applications, such as providing a rationale for reducing the total number of stock keeping units of toric contact lenses. SOURCE: Sha J, Fedtke C, Tilia D, et al. Effect of cylinder power and axis changes on vision in astigmatic participants. Clin Optom (Auckl). 2019;11:27-38. This study evaluated the effects of different contact lens (CL) replacement schedules and different CL materials on the ocular surface and tear function. Daily disposable hydrogel CLs were given to group 1 (n=22), daily disposable silicone hydrogel CLs were given to group 2 (n=25) and reusable silicone hydrogel CLs were given to group 3 (n=24). Tear function tests and inflammatory cytokine [interleukin (IL)-6, IL-8, IL-17A, and matrix metalloproteinase (MMP)-9] levels were evaluated before, and at one and three months after CL usage. Impression cytology was evaluated before and at three months after CL usage. At the first and third months of CL usage, a statistically significant difference was determined between the groups in the levels of IL-6, IL-8 and IL-17A in tears, with the lowest levels in group 1 and the highest levels in group 3. At the third month of CL usage, the levels of these cytokines (in picograms/milliliter) were 6.06 ± 0.83, 78.18 ± 12.42, 61.69 ± 13.95 and 37.71 ± 5.95 in group 1; and 8.04 ± 0.89, 107.34 ± 14.40, 68.63 ± 13.72 and 46.26 ± 6.50 in group 3, respectively. A statistically significant decrease was determined over time in the Schirmer’s test in group 1, in only the tear breakup time in group 2, and in the tear breakup time and Schirmer’s test in group 3. A statistically significant increase was determined over time in the levels of IL-6, IL-8, IL-17A and MMP-9 in all groups. In the third month, a significant progression was observed in the Nelson grade in all groups. Researchers concluded that the wear of daily disposable CLs could be considered to cause less damage to the ocular surface and less increase in proinflammatory cytokine levels. SOURCE: Muhafiz E, Bayhan HA, Şahin S, et al. Evaluation of the ocular surface in different contact lens replacement schedules. Cornea. 2019;38(5):587-94. This study evaluated the dry eye disease and meibomian gland dysfunction with meibography of Seborrheic Dermatitis patients. A hundred eyes of 50 patients with seborrheic dermatitis (group 1) and 100 eyes of 50 healthy individuals (group 2) were enrolled in this prospective study. A comprehensive ophthalmic examination including lid margin alterations and meibomian gland obstruction assessment, Ocular Surface Disease Index assessment, tear film break-up time test, corneal and conjunctival fluorescein staining assessment, and Schirmer’s test were performed on all subjects. In addition, upper and lower lids were evaluated for meibomian gland loss with non-contact meibography. The meibomian glands were graded from grade 0 (no loss of meibomian glands) to grade 3 (gland loss >2/3 of the total meibomian glands). The mean ages of group 1 and group 2 were 29.1 ± 9.1 (range, 18 to 48) and 30.6 ± 6.3(range, 20 to 49) years, respectively. MGD (n=19, 34.5%), meibomian gland loss (36.4% ± 18.1), upper meiboscore (0.7 ± 0.8), lower meiboscore (0.6 ± 0.7) and DED (n=10, 18.2%) were significantly higher in the SD patients compared with the control participants. There was a significant relationship between age with meibomian gland loss, MGD and DED. Researchers determined that seborrheic dermatitis might influence meibomian gland morphology and, as a result, cause meibomian gland dysfunction and dry eye disease. For this reason, they recommended that patients with seborrheic sermatitis be evaluated for meibomian gland dysfunction and dry eye disease, and start treatment when needed. SOURCE: Yasar E, Kemeriz F, Gurlevik U. Evaluation of dry eye disase and meibomian gland dysfunction with meibography in seborrheic dermatitis. Cont Lens Anterior Eye. 2019; Mar 25. [Epub ahead of print]. Bausch + Lomb began distributing its Lotemax SM (loteprednol etabonate ophthalmic gel) 0.38% to U.S. pharmaceutical distributors. The company received final approval by the FDA on Feb. 22, 2019. The new gel drop formulation of loteprednol etabonate was designed with novel SubMicron (SM) technology for efficient penetration to key ocular tissues at a low preservative level and a pH close to human tears. It is indicated for the treatment of postoperative inflammation and pain following ocular surgery. Lotemax SM delivers a submicron particle size and provides two times greater penetration to the aqueous humor as compared with Lotemax Gel (loteprednol etabonate ophthalmic gel) 0.5%. In addition, it was formulated with moisturizing ingredients, a pH close to that of human tears and the lowest BAK preservative percentage in a loteprednol etabonate formulation (same percentage as Lotemax Gel [0.003% percent]). Read more. The FDA approved Fera Pharmaceuticals’ New Drug Application for Avaclyr (acyclovir ophthalmic ointment) 3% for the treatment of herpetic keratitis. Orphan drug exclusivity was also granted, providing seven years of marketing exclusivity for the product. Fera launch plans include finalizing its selection of a commercialization partner to provide physicians and patients access to this important therapy. Read more. RightEye has built an extensive database of more than one billion eye-tracking data points from more than 100,000 patient tests conducted using the RightEye system. Research and health institutions are using the company’s data to examine the eye-brain connection. The anonymized data is providing researchers with a new and deeper understanding of early indicators for neurological issues, which are anticipated to help in the development of new treatment options and interventions. Read more. The Neuro-Optometric Rehabilitation Association, International announced that its new NORA Weekly Digest newsletter, a weekly email news briefing currently available to NORA members, is now available free to optometrists and other eye care and allied healthcare professionals interested in the area of neuro-optometric rehabilitation. The newsletter, developed in partnership with Bulletin Healthcare, provides an unfiltered look at news relevant to those interested in the area of medical and/or functional optometric rehabilitation services for patients who have suffered a traumatic brain injury, such as a concussion, or due to a medical condition such as stroke, tumor, aneurism, meningitis and cerebral palsy, or other neurological insults. Subscribe here. Optometric Physician™ (OP) newsletter is owned and published by Dr. Arthur Epstein. It is distributed by the Review Group, a Division of Jobson Medical Information LLC (JMI), 11 Campus Boulevard, Newtown Square, PA 19073. To ensure delivery, please be sure to add Optometricphysician@jobsonmail.com to your address book or safe senders list. Click here if you do not want to receive future emails from Optometric Physician. E-mail optometricphysician@jobson.com or FAX your news to: 610.492.1039. For information on advertising in this e-mail newsletter or other creative advertising opportunities with Optometric Physician, please click here for advertising information.